Publishing Perspectives is proud to launch “The Play’s The Thing,” a one year, roughly chronological exploration of the plays of William Shakespeare. Dennis Abrams will once again lead the group as we explore his work from every angle possible: the plays themselves, the development of character (or what Harold Bloom would call “the invention of the human,” the ways that the plays have been interpreted (and misinterpreted) through the years, and the production history of each play, both on stage and on film. 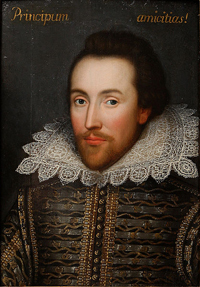 Most of all, we’ll be tracing Shakespeare’s own development as a playwright, as we witness the playwright of the early comedies and histories become William Shakespeare, the man who, in just one fourteen month period wrote three of literature’s most towering works: King Lear, Macbeth, and Antony and Cleopatra. How is that even possible? I hope you’ll join us as we set out to find out. Subscribe to our RSS feed, or click on the right to subscribe via email. YA Shakespeare: do you know Leon Garfield’s _Shakespeare’s Stories_ for kids? No…should I? How do they compare to…Lamb? It’s been some time since I wanted to thank you for this superb endeavour. Yours is one of the best sites on Shakespeare I’ve encountered. Best regards! Thank you so much…VERY much appreciated! What a splendid site! I giving it out as a Christmas gift to all my friends. Thank you so much for creating this site. Your commentary on Hamlet is riveting. Love it . Thanks Dennis. I just wrote a short commentary of Troilus. What do you think of the correctness of it? Nice take. I suspect another reason the play was so rarely performed and had to be “redisovered” (in the same way, let’s say as Titus) is that it’s so dark a take…is there one “honorable” character in the play? But yes, in bitterness and pessimism it’s almost like King Lear, although not as macabre as Titus. True. But I suspect we see it very differently than, let’s say a Victorian audience. In the same way that although the uber-patriotic Henry V is still a viable read, we can now also read it as a very much anti-war, anti-imperialistic play as well.